Lee Woolery|Miami Valley Sunday News Butler’s Bryant Johnson dunks in transition Friday against Troy. Lee Woolery|Miami Valley Sunday News Butler’s Quentin Glover scored a career-high 21 points in Friday’s win over Troy at the Trojan Activities Center. Lee Woolery|Miami Valley Sunday News Troy’s Austin Stanaford drives to the basket Friday against Butler. Lee Woolery|Miami Valley Sunday News Troy’s Brayden Siler tries to shoot over a Butler defender Friday. Lee Woolery|Miami Valley Sunday News Troy’s Caillou Monroe drives to the basket between a pair of Butler defenders Friday. Lee Woolery|Miami Valley Sunday News Troy’s Jaden Owens drives around Butler’s Alex Plummer Friday. Lee Woolery|Miami Valley Sunday News Troy’s Shaeden Olden pulls up and hits a jumper Friday against Butler. Lee Woolery|Miami Valley Sunday News Troy’s Tre’Vone Archie hits a 3 late in the fourth quarter Friday against Butler. 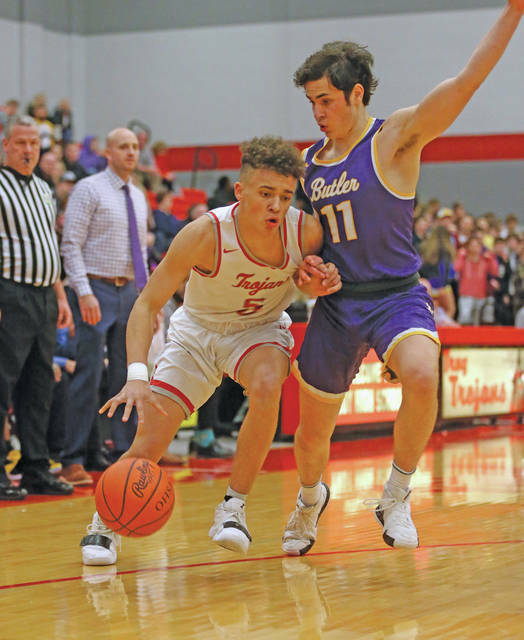 TROY — The Troy basketball team gave everyone else something to think about heading into Sunday’s Division I sectional tournament draw. But in the end, Butler did what potential top seeds do. The Trojans battled the Aviators — ranked No. 9 in the latest D-I state poll — all night long, never trailing by more than eight points, holding a lead early in the fourth quarter and keeping the score tied with four minutes to play. But Butler made clutch plays down the stretch, including a steal and transition dunk by Bryant Johnson with 1:12 to go, and got a career night out of Quentin Glover and was able to escape the Trojan Activities Center with a hard-fought 59-55 Greater Western Ohio Conference American North Division victory Friday night. 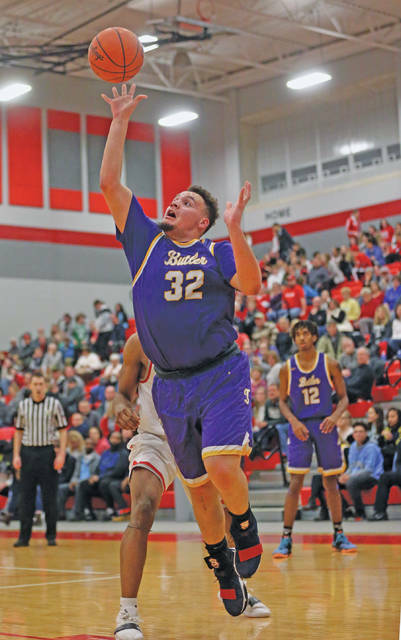 It was the eighth straight win for Butler, which improved to 18-2 overall and remained tied with Sidney atop the GWOC American North Division at 11-2. Playing for the first time without senior point guard Michael Kreill, though, the Aviators knew they’d be in for a fight. “We found a way to win tonight,” Butler coach D.J. Wyrick said. “We never got rattled, we knew we had a chance to win and had the lead for the majority of the game. If we make a couple of 3s or grab a couple of offensive rebounds that seemed to bounce their way, this game is different. But I’m proud of the way we continued to compete and fight and just grind one out. And that should make give the Trojans hope as the postseason draws near, with Butler likely to be the No. 1 seed in the sectional draw come Sunday. 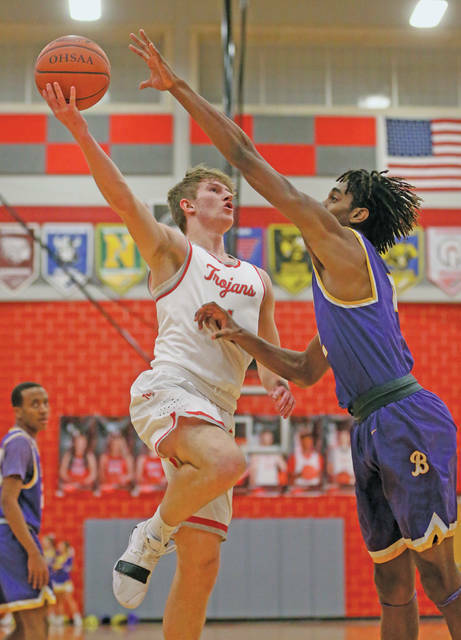 The Trojans fell to 6-12 on the season and remained in third place behind Butler and Sidney in the division at 5-8, yet they turned in arguably their best performance of the season against tough competition. 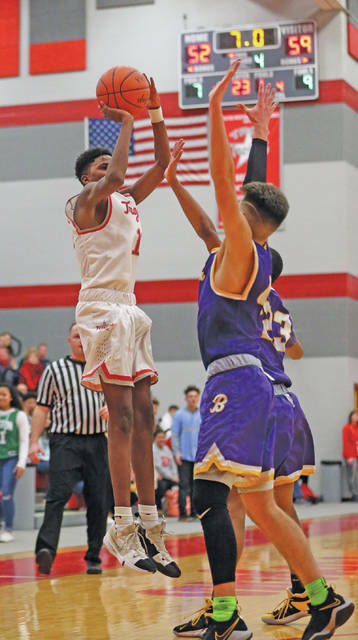 Leading the way for Butler was senior post Glover, who scored a career-high 21 points and added eight rebounds, helping the Aviators claim a 44-35 edge on the glass and hurt the Trojans with second-chance points. But while the Aviators built a huge lead in the first meeting between the teams back on Dec. 14, 2018 then held off a late rally for a 58-50 win, Friday night’s matchup was a battle from the start. The lead changed hands five times in the first quarter alone until Glover kicked off a quick 6-0 spurt with a bucket inside to give Butler a 10-9 lead. Braedon Norman followed that with a layup and Cooper Justice stole an in-bounds pass — the only turnover for either team in the first quarter — and took it the other way for a layup to put the Aviators up 14-9. Tre’Vone Archie hit a long 3 to keep the Trojans in the game, though, and Butler held a 17-13 lead after one. And the Aviators maintained that advantage throughout the second quarter but never led by more than six, holding a 31-25 lead at halftime. A putback by Glover with 3:16 left in the third gave Butler its biggest lead of the game at 41-33, but a bucket by Archie, a transition 3 by Jaden Owens and a third-chance putback by Caillou Monroe got Troy to within one before a Johnson tip-in at the buzzer gave the Aviators a three-point lead heading into the final quarter, 43-40. A pair of free throws by Archie gave Troy its first lead since the opening quarter at 45-43 with 6:46 to play, then Olden hit a 3 after Butler had tied the score to keep the Trojans in front at 48-45. But a free throw by Johnson and steal and layup by Tyler Montague tied the score again with 4:25 to go, and another steal and layup by Norman gave the Aviators a 50-48 lead and forced Troy to call timeout with 3:13 to play. The Trojans missed an open shot at a 3 to retake the lead, then Norman drilled one on the other end to make it a five-point game. Troy closed to within three with less than two minutes to play, but Johnson stole the ball on the perimeter again and threw down a one-handed dunk to keep it a two-possession game with 2:4o on the clock. Archie hit two more free throws to cut the lead to three again at 55-52 and Troy had the ball with a chance to close the gap more, but the Trojans couldn’t connect on a back-door alley oop pass, and Glover converted that turnover into a bucket in the paint on the other end with 25 seconds to go that essentially put the game out of reach. After Glover’s big night, Johnson added 12 points and six rebounds for the Aviators. Norman chipped in nine points, Montague had seven points and seven rebounds, Matt Beverly had six points and Justice had four points and eight rebounds. Archie led the Trojans with 17 points and five rebounds, Olden finished with 16 points — 12 in the first half — and six rebounds, Monroe had eight points and seven rebounds, Austin Stanaford had seven points and five rebounds and Owens had seven points. 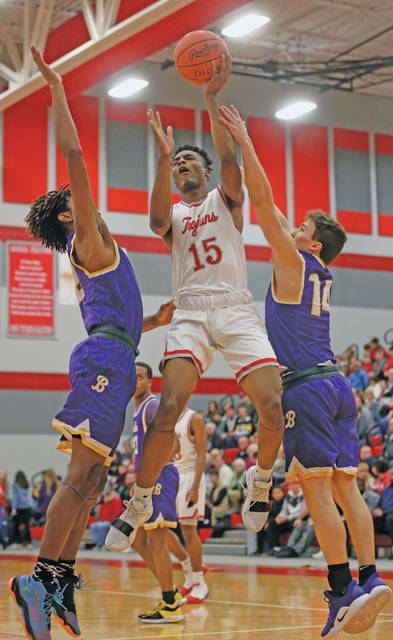 Next up for Butler is the rematch for the GWOC American North championship, as the Aviators travel to Sidney to face the Yellow Jackets Tuesday. After hosting Celina on Senior Night Saturday, the Trojans host Tippecanoe Tuesday in their final home game of the season. Because to Bremigan and the Trojans, there’s no moral victories — even in pushing a state-ranked team to the brink. https://www.vandaliadrummernews.com/wp-content/uploads/sites/19/2019/02/web1_020819lw_butler_bryantjohnson.jpgLee Woolery|Miami Valley Sunday News Butler’s Bryant Johnson dunks in transition Friday against Troy. https://www.vandaliadrummernews.com/wp-content/uploads/sites/19/2019/02/web1_020819lw_quentinglover.jpgLee Woolery|Miami Valley Sunday News Butler’s Quentin Glover scored a career-high 21 points in Friday’s win over Troy at the Trojan Activities Center. https://www.vandaliadrummernews.com/wp-content/uploads/sites/19/2019/02/web1_020819lw_troy_austinstanaford.jpgLee Woolery|Miami Valley Sunday News Troy’s Austin Stanaford drives to the basket Friday against Butler. 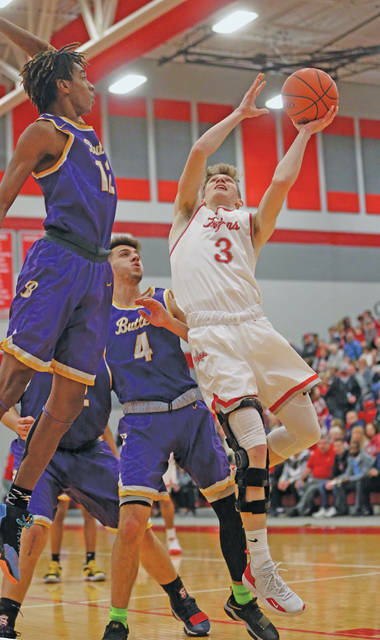 https://www.vandaliadrummernews.com/wp-content/uploads/sites/19/2019/02/web1_020819lw_troy_braydensiler.jpgLee Woolery|Miami Valley Sunday News Troy’s Brayden Siler tries to shoot over a Butler defender Friday. https://www.vandaliadrummernews.com/wp-content/uploads/sites/19/2019/02/web1_020819lw_troy_cailloumonroe.jpgLee Woolery|Miami Valley Sunday News Troy’s Caillou Monroe drives to the basket between a pair of Butler defenders Friday. https://www.vandaliadrummernews.com/wp-content/uploads/sites/19/2019/02/web1_020819lw_troy_jadenowens.jpgLee Woolery|Miami Valley Sunday News Troy’s Jaden Owens drives around Butler’s Alex Plummer Friday. 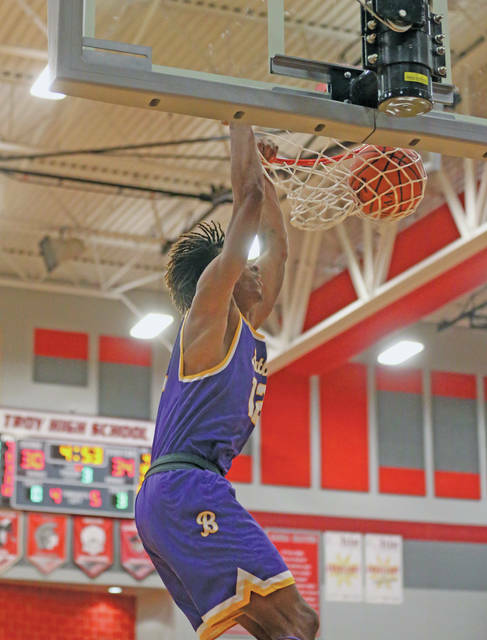 https://www.vandaliadrummernews.com/wp-content/uploads/sites/19/2019/02/web1_020819lw_troy_shaedenolden.jpgLee Woolery|Miami Valley Sunday News Troy’s Shaeden Olden pulls up and hits a jumper Friday against Butler. 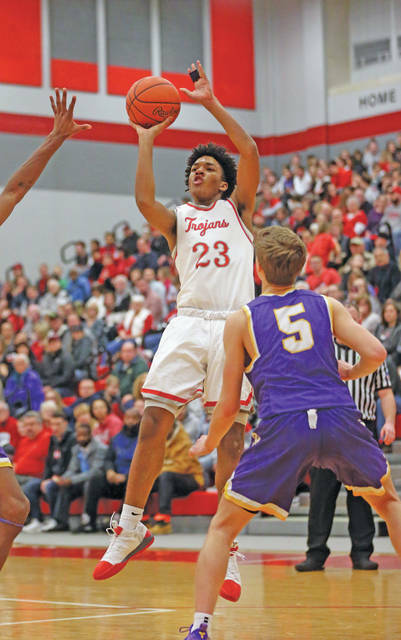 https://www.vandaliadrummernews.com/wp-content/uploads/sites/19/2019/02/web1_020819lw_troy_trevonearchie.jpgLee Woolery|Miami Valley Sunday News Troy’s Tre’Vone Archie hits a 3 late in the fourth quarter Friday against Butler.